Safe streets activists and residents along a major San Francisco thoroughfare known for speeding and collisions, injuries and death are finally seeing tangible changes. During the fall of 2017, construction crews have installed a median in the eight-block corridor along with street trees, new sidewalk lamp posts, bus bulb-outs, wider sidewalks, and a raised bike lane on either side. 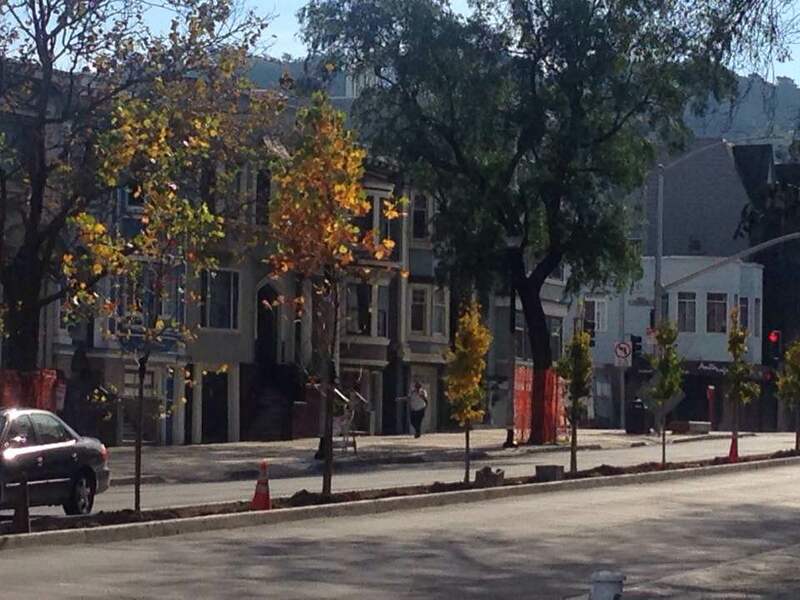 To accommodate the new infrastructure – especially the bike lanes where none previously existed – all parking spaces on both sides of the street has been removed permanently. This work followed sewer upgrades. The final improvements, including badly needed repaving, will be concluded early in 2018. 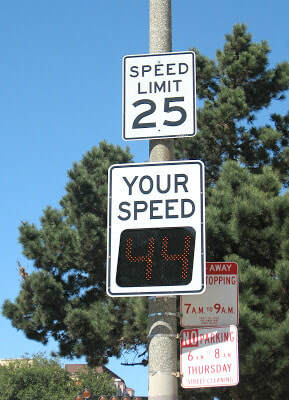 More than ten years ago residents along Masonic joined street safety activists to lobby for a new street design that would discourage speeding and the resulting injuries and deaths. From 2009 to 2014, 119 traffic collisions occurred along this eight-block route. These included 14 pedestrian-vehicle collisions and 24 bicycle-vehicle collisions. 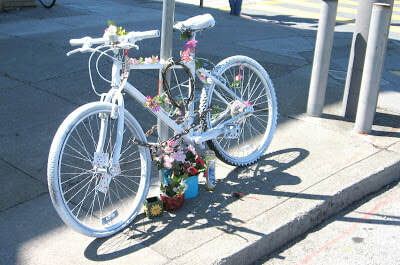 Two bicyclists were killed. Masonic Avenue has been one of the “high injury streets” identified in the city’s Vision Zero plans to eliminate all traffic deaths by 2024. 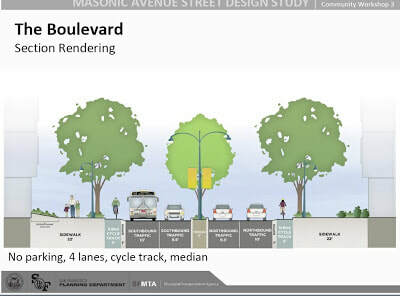 The coalition of neighbors and activists charged that Masonic had functioned as a freeway through the residential neighborhood with wide-open vistas and a grade that encouraged speeding. Dozens of neighborhood meetings, a petition with 500 signatures, lobbying at City Hall, and testimony at transportation hearings followed. Finally in 2008, the San Francisco Board of Supervisors approved a redesign of Masonic. Even more planning sessions followed with the staff of the Municipal Transportation Agency. Construction began in August 2016. 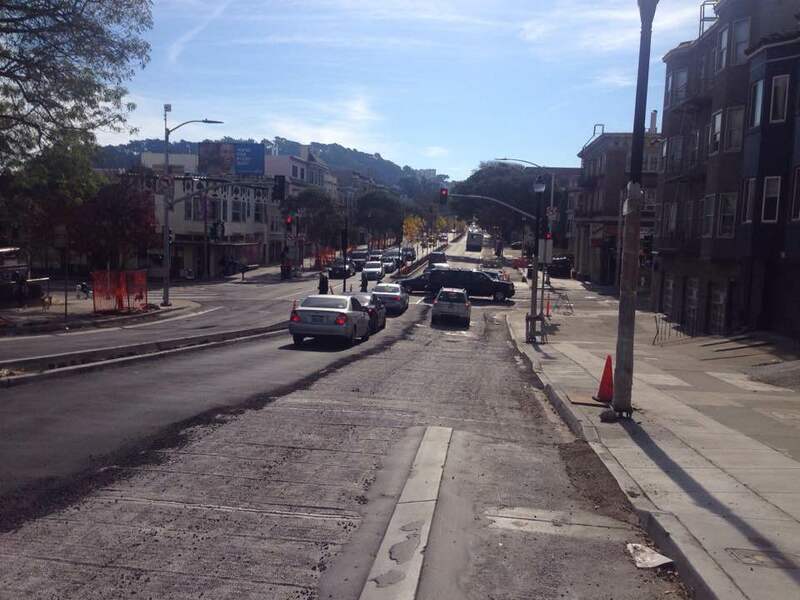 I joined the advocacy effort in 2009 and publicized safety issues with my BIKE NOPA blog, highlighting bicycling issues in the North of Panhandle (NOPA) neighborhood of San Francisco. Masonic Avenue serves as the western boarder of the neighborhood. Over a two-year period my blog featured hundreds of posts about the thoroughfare. Included was coverage of nearly all the public meetings related to the redesign efforts, interviews with bicyclists, pedestrians, and drivers who found Masonic dangerous, survey results showing broad neighborhood support for the proposed changes, and the views of the minority of residents who opposed changes on the street. The concerns of those critical of the project most often cited the hardships that would accompany removal of all street parking. The city will mitigate some of the parking loss by creating new parking spaces on side streets. (To review the many Masonic-related posts, click this link).